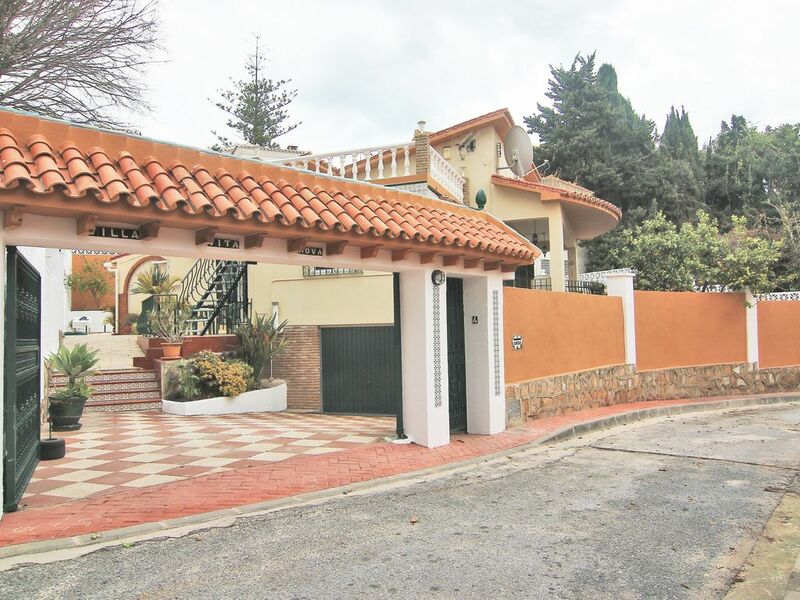 Private, large 4 bedroom family villa sleeping up to 11. Car hire not necessary! Villa Vita Nova is a lovely villa in a secluded residential cul-de-sac. It is situated in the heart of Benalmadena Costa, just 5 minutes' walk from the sandy beaches and the bustling yacht marina - Puerto Marina. All the amenities are just a few minutes walk away - shops, bars, restaurants, pharmacy, supermarket, and tourist attractions. The villa is perfect for all age groups - friends and family groups. The pool area can be closed off by gates to keep kids safe. The rooms in the villa are large, bright and spacious. There are 4 bedrooms, 3 bathrooms, a large lounge and separate dining room. Double sofa bed, single sofa bed. There is a lovely kitchen with ceramic hob and granite work surfaces. We have a pool, which is solar-heated, a jacuzzi, table tennis, table football, darts, snooker/pool table, kids corner with play house. The pool area is gated. There are various patio areas around the villa - some shady and some sunny. If you are a real sun worshiper there is a roof top terrace . There is air-conditioning and wifi. The TV has an excellent selection of British and European language channels. We also have a selection of DVDs, books, games. You'll be within 5 minutes walking distance to the sandy beach, Puerto Marina, Sea Life Centre, shops, huge selection of restaurants. From Puerto Marina you can take boat trips along the coast or dolphin watching - or just stroll along and enjoy the wonderful atmosphere! You can get a taxi or bus to Tivoli World, The cable car, the local Water Park, Butterfly Park and to the Crocodile Park. Or, an excursion to Mijas, Ronda, Granada, Cordoba, Gibraltar..... These can be booked locally and there is an information file in the villa to help you. Child safety: The swimming pool area is fenced from the rest of the garden. Facilities for children include: cots; high chair; push chair; baby bath, etc... please see my website for more details. I am Spanish, married to a wonderful English lady! We live locally and available should have a problem. We used to live in this villa and so know what a great location it is! It is so convenient to everything and makes life just so easy! It's a comfortable villa, you'll feel relaxed and have lots of space for everyone! Please bring beach towels for use on sunbeds and beach. Table tennis, darts, table football, kids blackboard and easel. Snooker/pool by the BBQ. KIDDY SAFETY - Some of the things you'll find at the villa to make your holiday more comfortable are cots, high chair, bed guard, baby bath, infant potty, door stoppers, socket protectors, etc. The pool as a gate either side if you want to stop kiddies wandering to the pool. For your kids enjoyment - safety darts, games, DVD's, books, blackboard and easel. DISABILITY FACILITIES - there are ramps for the outside steps and the villa is one level apart from just one step from dining room where a ramp is also available. Please check with owner for suitability. Really lovely spacious villa ! Wonderful - I hope to see you all again soon!